That changed when a video of the song went viral this week on the Internet. 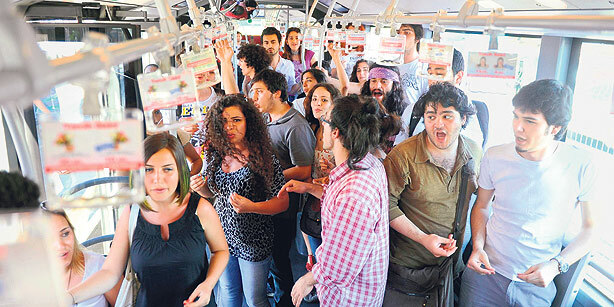 In the video a group of people - - who appear to be ordinary commuters - - in one of the crowded cars of the Istanbul metro start to sing “Jericho” totally out of the blue - - to the astonishment of the rest of the commuters. The young commuters performing this strikingly beautiful a cappella rendition of the song turned out to be the members of the Boğaziçi University Jazz Choir, who came up with this brilliant idea to seek sponsors for their upcoming stint in an international choral competition in Austria. Their simple but effective idea indeed struck a chord with many. Despite the numerous national and international awards they have won previously, the Boğaziçi University Music Club Jazz Choir (their full name) instantly became one of the country’s most popular ensembles, with their videos on various websites receiving over 300,000 hits and being shared by hundreds on social networks in just two days.